Anytime there is a change of season, I always get so excited for the new styles!! For this Spring, it's florals, fun colors and denim! A few of my favorite things. When I started shopping for Spring online, I found so many cute and fun pieces at Walmart. Their new partnership with Maurices has all the Spring essentials. With sizes from 0-24, super affordable prices and FREE shipping over $35, it's hard to beat!! You can also order online and pick up in the store to get it even faster. I'm rounding up my favs at the end of this post. You should know by now that I'm a huge denim lover!! I can be seen wearing jeans most days, both dressed up and casual. So of course when Spring/Summer rolls around, I'm looking for a variety of jean shorts. I was so happy to find this distressed boyfriend pair at Walmart. I'm wearing my true size 2, but they do stretch when wearing, so I might even suggest sizing down if you like a tighter fit. I decided to style these jean shorts 2 ways with pieces from the Maurices Collection. 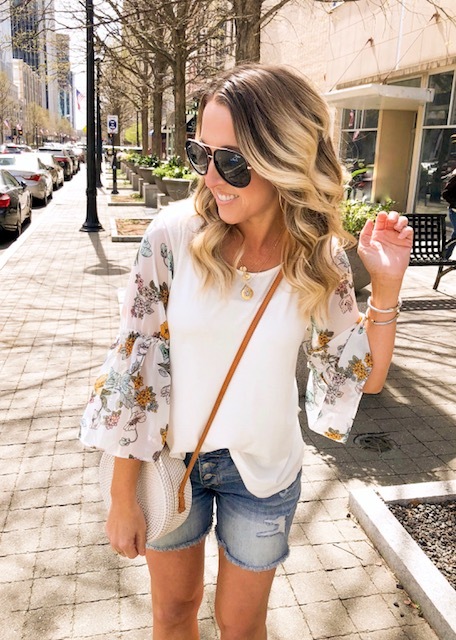 The first being with an adorable floral sleeve top. Just look at these sleeves!!! I love the light floral and the loose fabric. Perfect for warmer weather. I wore this top earlier this week with black jeans and flip flops and loved that outfit too!! The second look is just as cute as the first. It's a fun combo of a Spring cardigan and sneakers! Heck, sneakers with anything is super cute. Don't you love these wide stripes??? They are a pretty color combo of navy and mint green for Spring. The sweater is the perfect lightweight material too. I'm wearing a small in the cardigan. Be sure to check out the entire Maurices collection. There are so many great pieces and something for any Spring/Summer occasion.